When we holidayed earlier this year in Fiji, we spent a few nights on the Island of Kuata in the Yasawas, a string of beautiful Volcanic islands. One morning we went snorkelling off the back side of the island with the guide, Berry. It was a little overcast and there wasn't a great deal of interesting aqua-life to see. Suddenly, Berry darted away from us, swimming fast towards the ocean floor as we watched, intrigued. From inside our murky snorkel-masks, we could just make out Berry picking up something quite large from off of the reef. When he eventually bobbed back up at the surface, we swam over to join him and to admire his catch - a huge triton shell. I asked Berry what he was going to do with it. He told me he would remove the meat and sell it to the Chinese for a substantial Fijian $25 return. 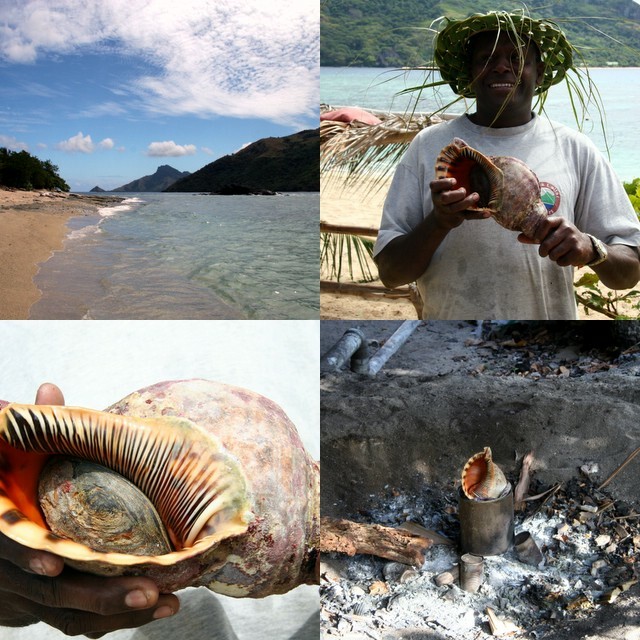 A day later, in a less touristy spot on the island, we spied evidence that the shell had been cooked and the meat removed although I couldn't find any more information about how it is actually eaten. As we were leaving the island we found out that it is actually illegal to fish the Triton in Fiji, not so much because of the scarcity of the shells, but because they are predators of the reviled Crown of Thorns starfish. According to some sources, this law is outdated and never acted upon. It has been said: "To ban the possession of Davui is a little unrealistic in a society where these shells have longstanding traditional significance:- if this regulation were enforced it would probably put every member of Parliament in jail." Archive Alert! On this date in 2004: Of all the food photo's I've taken, this is my favourite, bar none. Sam -- If you have seen scungilli on Italian menus in New York or conch in Florida, you know where "triton" ends up. I cooked it only once, out on the tip of Long Island, when someone brought the whole thing in the shell to my house. It is very -- umm --strange to pull the large meat from its habitat; it sort of resists and then comes almost squirming out (even though it's cooked). The meat itself is rather chewy and mild, a little bit like octupus,which is why Italians slice it up into bright tomato sauce and serve it with pasta. Bink! I was gonna say it's probably a lot like conch too. Tough little mofos. We used to eat conch fritters at a cafe on the Florida Keys, forget which one. kudzu: I thought scungilli was sea slug until I saw your comment, and did a little research. Looks like I was wrong. My mother and I used to love eating Conch fritters in St. Croix. I remember this meat fondly and then those beautiful pink interiored shells lay magnificently all over the beaches. I love how you made the photo collage, it too is gorgeous. Kudzu, Cookie Crumb and Shuna - thanks for all the information. of course If I had looked up the food bit as conch instead of triton the search might have been more successful. Fargirl - I am glad someone likes Fiji Fridays. i for one like putting them together!